Vacation Rental Desk&apos;s software allows you to do more than just set daily and weekly rates for your vacation rental. With our booking calendar software, you can completely customize your rates and fees to generate more rental income. Many factors contribute to peak seasons and slow periods in your vacation rental business. If you own a mountain cabin where it snows, chances are your peak season is in the winter when skiiers and snowboarders come to relax and have fun. Although your winter rates may span from November to March, what do you do if you want to charge peak rates for the months of December and January? 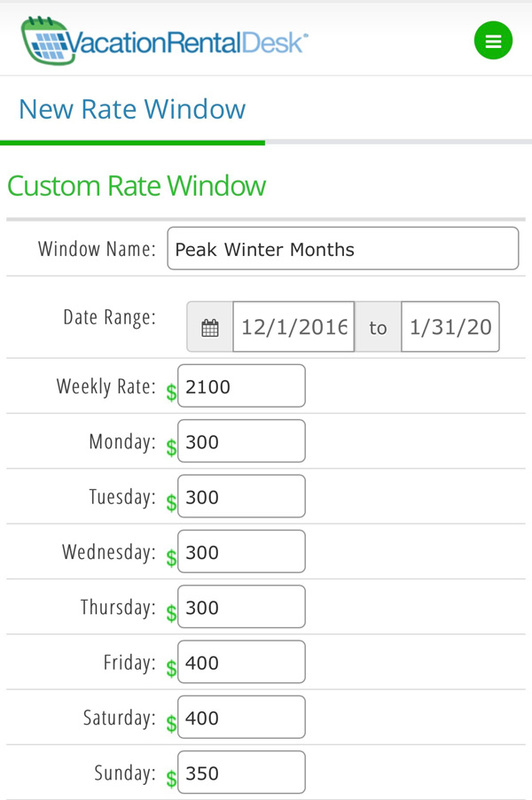 Rate Windows allow you to override your standard daily and weekly rates for an entire date range. In just a few clicks you&apos;ve created special pricing for two entire months. The new rate window can be seen on the calendar tab in green. You can even place a surcharge on a date within a Rate Window, such as adding a $100 surcharge on Christmas Day within your peak season rate. You can set special rates for individual dates by placing surcharges on them. To place a surcharge on a date, sign-in and click the Calendar tab, and change the drop down menu from "Show Reservations" to "Show Rates" (on the top of the calendar). Next, enter the amount of the surcharge and a name for the date. The surcharge will be added to default pricing for the date. Holiday rates will be shown on the Calendar tab in yellow. 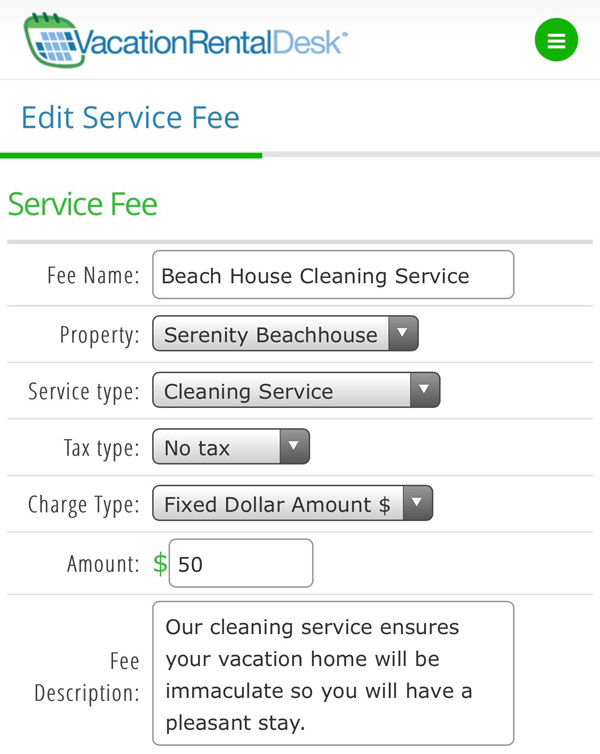 You can create custom service fees for any service your vacation rental requires. Tax can be charged on service fees, they can be marked as optional or required, and they can have preset charge intervals so that a fee is charged daily, weekly, or every X days in a reservation (great for cleaning services that need to be performed on a routine basis). Just click the Settings tab and navigation to Rates, Fees & Taxes » Order Options, and click "Create New Service Fee". Is the beginning of your week difficult to book? Many rental owners and managers find that Mondays, Tuesdays, and Wednesdays are typically the slowest days for vacation rentals. Try a sliding scale pattern for your daily rates. Offer lower rates for Monday, Tuesday, and Wednesday nights, and charge more for Thursdays and Sundays with peak rates on Fridays and Saturdays. Try setting a 5-night or 6-night minimum for bookings. Offer coupons for week-long stays or to encourage longer stays in general by setting nightly minimums on coupons. "Local" destinations, such as Big Bear Lake for Southern California residents, will typically experience more open Mondays through Wednesdays because most people visit for the weekend or for just a couple days at a time. Travel destinations which require jumping on a plane or a long drive should have much higher occupancy rates. Exceptions are for some lake destinations like Lake Martin, AL, or Newport Beach, CA for example during summer seasons are fully booked during the entire season due to limited capacity on the waterfront. 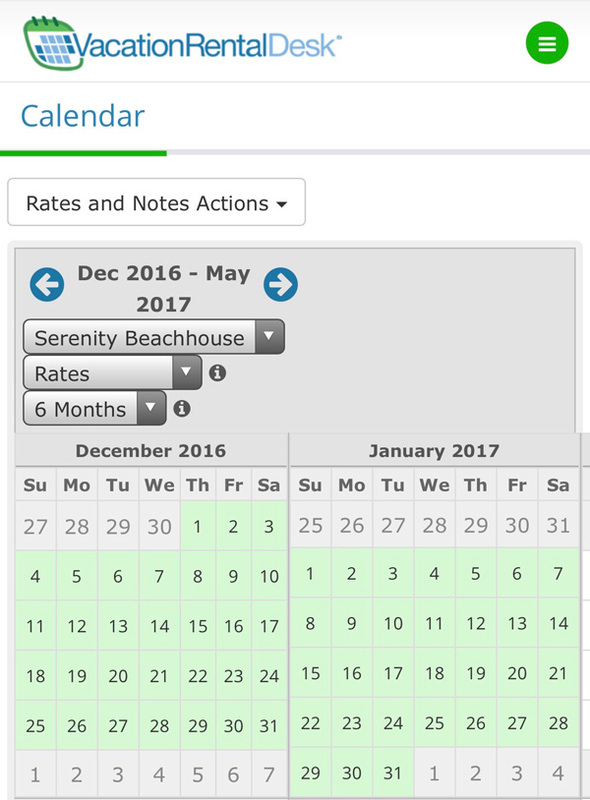 By popular demand, we&apos;ve added a date group feature to our booking calendar. 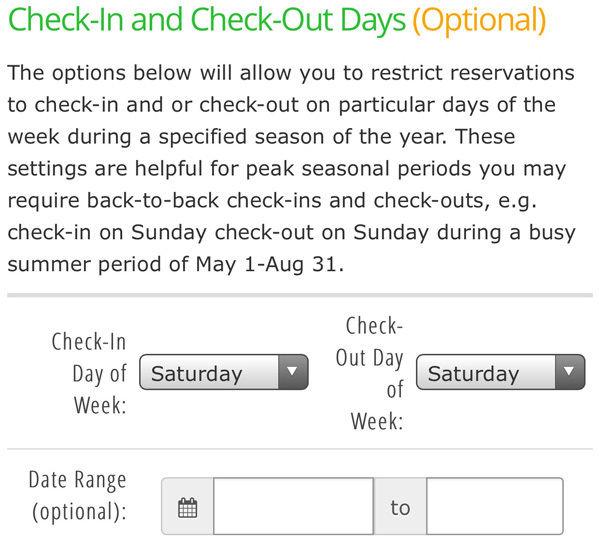 Owners and managers can now lock-in reservations for holiday or event rate windows. Date Groups allow you to specify a block of dates that must be booked together when a guest makes a reservation. For example, you probably do not want a guest to book Christmas Eve but check-out on Christmas Day. To take full advantage of your rental&apos;s income potential, you can create a create a Date Group for 12/24-12/25 so that the nights of both Christmas Eve and Christmas Day must be reserved together. This works equally well for local events, and holidays that shift around on the Calendar, such as Memorial Day. Date Groups can be found under the Settings tab in Rates, Fees & Taxes » Date Groups, and click "Create New Date Group". Also, owners and managers can set specific requirements for Check-ins and Check-outs by days of the week. To increase revenue during peak seasons (or for any other reason), you can now control which days of the week guests can check-in and check-out on. You can find this feature in the Settings » Booking Policy section of our Member Dashboard. You can learn more about the features described here by reading the "Rate Windows" Quick e-Learning Guide, available from the help section of your Vacation Rental Desk.